There’s something about life that you won’t find anywhere else. The Copenhagen Context Driven Testing meetups are becoming a tradition thanks to the work of Carsten Feilberg and Agniezka Loza. In June, I chaired a workshop in Ballerup near Copenhagen during one of the meetups. 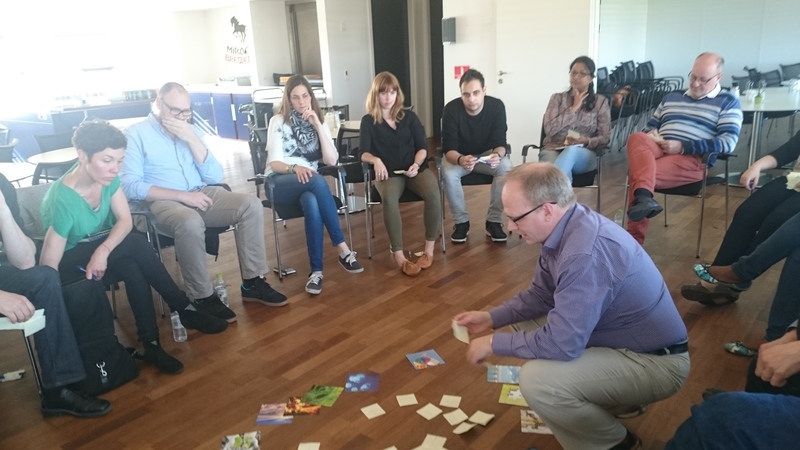 16 testers shared ideas about values in software testing. There are four or five basic human values which everyone shares. The good, the beautiful, the true and the just. Freedom relates to these four. We express and rate them differently and they are intrisic to us, subjective, but still shared among humans. My personal human values shape my actions, words and thoughts, and thus also the words and expressions I use in my daily language. My language can tell you about my values and therefore something about who I am. In the workshop I chaired in June, I asked the participants to pick picture cards to illustrate thoughts about testing. Then they spoke about the picture and about testing. We shared our words and statements on post-it’s and I collected them. I was busy at work after the workshop, and the box with the words ended up on my desk. Summer and vacation came, and I procastrinated opening it. One of the last days of vacation, I finally read the words on the post-it’s. Knowledge; Information; Curiosity; Exploration; Investigation; Fight :-); Courage; Confidence; Balance; Collaboration; Evolvement; Surprise; Order; Performance; Discovering stuff, that others have not (yet) discovered; beautiness. Usability (easy/better ways of using stuff). Universatility. User experience design; Good (better) end user experience; user needs; user satisfaction; Sustainability. Creativity. Responsibility. Curiosity; Easeing somebody else’s job; Striving; Alertness; Communication; Added communication; added collaboration; information sharing; Building bridges; (Make it) fun; Excellence; Any word / anything; Getting a kick; Covering / exploring; Contradictions / paradoxes; Building trust; Finding (new) ways; Getting to know; Helping; Revealing; Avoiding losses; Whole solutions; Support descisions; Transparancy; Quality; Assessing quality; Avoid scandals; Improvement; Business needs; Filling gaps; People; To spoil illusions (own and others’); Digging for something deeper; Truth; Structure; Growth; Responsibility; Team work; Exploration; Progress; Seeing/finding possibilities; Erkendelse/Erkenntnis/realisation; Business value; Honesty. It’s interesting to note that many of the words above relate to the value ‘truth’. Testing implies couriosity, gives a kick, spoils illusions, happens through exploration etc. I consider ‘truth’ to be the fundamental core value in testing. Truth as a term is a complex thing, but when we use words that relate to the value ‘truth’, it’s easier to see. As a tester, I prefer things that are true and don’t accept stories that can’t be verified. I rate things that are more true than other things. For example, I tend to dislike reducing truth to numbers, and prefer a more nuanced understanding of subjects. I do have beleifs, hyphotesis, and test ideas, but at the end of the day, the ideas only prove their worth when they have been evaluated. Many (most?) of the words deal with things that are not related to ‘truth’: Reponsibility, easening other peoples jobs, evolvement, user experiences, whole solutions, improvement, business value etc. This reminds us that testers are not just concerned with ‘truth’, i.e. testing, but also value how testing is used and the results that the whole team or company achieves. What does this tell me as a testing leader? It tells me that in my leadership, I cannot only focus on testing ideas, spoiling illusions, and telling the truth if I wish to motivate and encourage our teams to work efficiently and independently doing their testing. I have to consider how the testing contributes to achieving other goals and higher goals. I have to consider that coorporation with colleagues work well. That the product we somehow help with is something that makes users happy. That there are bottom line results because of our testing. That disasters are prevented. These things are not just ‘context issues’. They are core to testing leadership. I have played with the words on the cards and come up with a mission statement for a hypothetical testing team. The mission statement somehow expresses this. Feel free to play with the words yourself. We are testers. We are ready to spoil illusions, both our own and others’. We have courage to do so and generally like to be surprised. So we always dig for something deeper, a deeper understanding, a realization, an ‘erkenntnis’. We get a kick when that happens. Through testing, we seek truth, but we also feel a responsibility to make our testing useful to create user friendly and whole solutions, support growth and improvement, and sustainability. Our testing thus aims to assist the creation of pleasing and aestethic solutions, to serve other peoples needs and hopes, and in general to do good. PS: The quote from my uncle Ole Brunsbjerg at the top of this article is to remind us that there is more to life than testing. Or anything else. Life is very rich and as humans, we value all of it.